ANDREA HOLBROOK/Staff photo/ Alprilla Farm's 4-year-old oxen, Clay and Cedar, were yoked up Tuesday morning to get a little exercise. The Essex farm's resident teamster Sophie Courser said the Red Durham shorthorns will soon start work ofr the season. 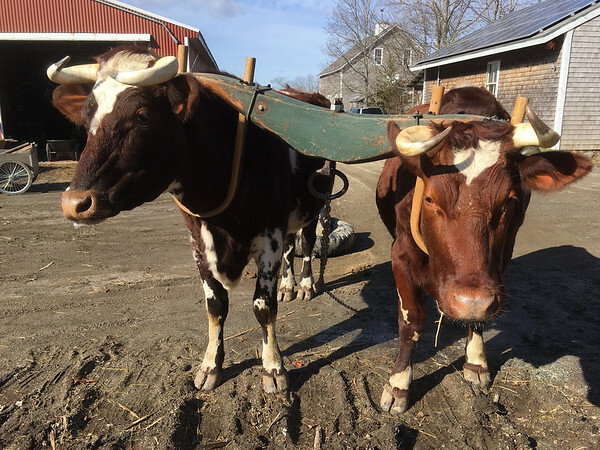 Alprilla uses the oxen in the winter to pull out firewood and fence posts, and in the summer to haul loads around the farm, harrow small patches, and cultivate one-row crops such as peas, beans and brussels sprouts. They can go where a tractor cannot.